Shelled pecan nuts resemble walnuts. However, the pecan clearly tastes sweeter and milder. Pecans have the highest nutrition value of all nuts and are rich in mineral nutrients and unsaturated fatty acids. They are ideal for cooking and baking, as decoration, in desserts and of course as a snack in between. Pecan nut trees grow up to 30 m high, they are native to the warm climates in North America where they are still grown, mainly in the USA and Mexico, but also in Australia. The trees, which also provide the popular hickory wood, belong to the walnut plants. 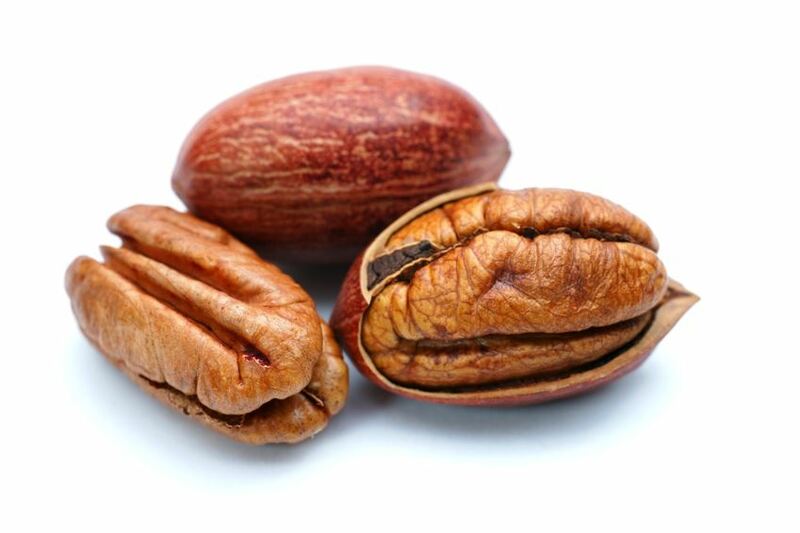 Although the pecan nuts in related to the walnut, its shell more resembles an oversized hazelnut. The shell is very thin and can also be cracked without a nutcracker. The kernel of the pecan nuts resembles the walnut more, but tastes significantly sweeter. The Indians of old times likes pecan nuts because of their high nutritional value, and in the first days of space travel, pecan nuts were considered a perfectly composed meal. Indeed, pecans have the highest nutrition value of all nuts and are rich in mineral nutrients and unsaturated fatty acids. Because of their delicious sweet taste, pecan nuts are mainly sold raw, with or without shell, and they are ideal for cooking and baking, as decoration, in desserts, and of course as little snack.